This is time to greet your dear ones in India with cool New Year gifts from the New Year exclusive gift collection of Giftacrossindia. 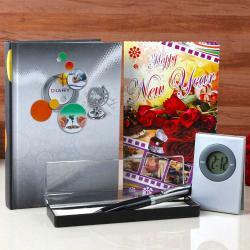 Here we come with the ultimate gift hamper which includes unique gifts like New Year Calendar with Watch in the calendar itself. This calendar is to update you time and date one at same time. 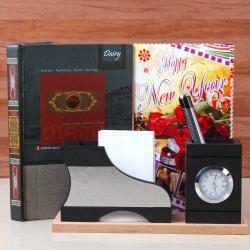 This hamper Includes New Year diary book for your business notes and other necessary along with the finest ball pen. The blue ink ball pen comes in black and silver case which sure matches your formal dress. 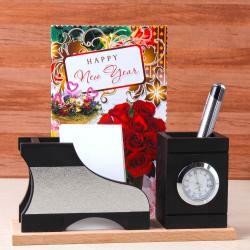 This hamper very useful in every manner and your recipient will be loved to receive it. So go ahead and purchase this hamper now. 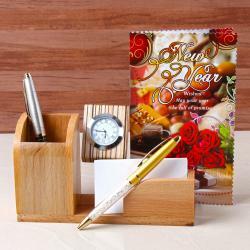 Product Includes: Diary Book with Pen and Calendar with Watch along with New Year Greeting Card.